Proposed legislation would stimulate local economies, create jobs and help Albertans save money on their energy bills. 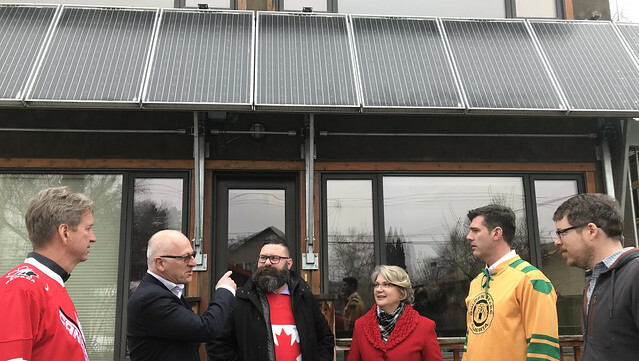 Minister Anderson visits Mill Creek NetZero home with (L-R) Paul Verhesen, Alberta Construction Association, David Dodge, Energy Efficiency Alberta, Wendy Jabusch, BILD Alberta, Mayor Iveson and Conrad Nobert, homeowner. If passed, An Act to Enable Clean Energy Improvements would give municipalities the option to establish a Property Assessed Clean Energy (PACE) program. The initiative would allow home and business owners to make their spaces more energy-efficient, without putting any money down. Financing for energy-efficient upgrades or renewable energy systems such as solar panels, high-insulation windows and high-efficiency heating and cooling systems would be repaid through the building owner’s property taxes. Often, the savings generated by the PACE upgrades would be greater than the annual repayment. The PACE program would also stimulate local economies and help create jobs. In North America, every $1 million in PACE project spending has resulted in at least 15 new jobs and $2.5 million in economic output. Since first implemented in California in 2008, PACE programs have expanded to every region in the United States, generating nearly $6 billion in economic activity. A number of Canadian jurisdictions, including Ontario, Nova Scotia and Quebec, have also adopted PACE legislation, increasing economic activity and creating local jobs. David Vonesch, COO, SkyFire Energy Inc. Increased demand for energy efficiency upgrades means more opportunities in Alberta’s green jobs sector. For instance, retrofitting every home that needs it in Alberta could put 6,500 to 14,000 Albertans to work over the next two years. An Act to Enable Clean Energy Improvements is in response to requests from municipalities across Alberta who have asked for PACE-enabling legislation to ensure there are more options for Albertans to make energy efficiency and renewable energy upgrades. Municipalities would have the choice as to whether to offer a clean energy improvement program. If the legislation is passed, government will consult with municipalities, lenders, real estate associations and other stakeholders to develop a regulation. The Alberta Climate Change Office and Energy Efficiency Alberta will work together over the summer and fall to design a PACE program, which will include a number of tools to assist municipalities. If passed, it is expected the legislation would come into force in early 2019. Municipalities would then need to pass a PACE bylaw before making the program available to residents.